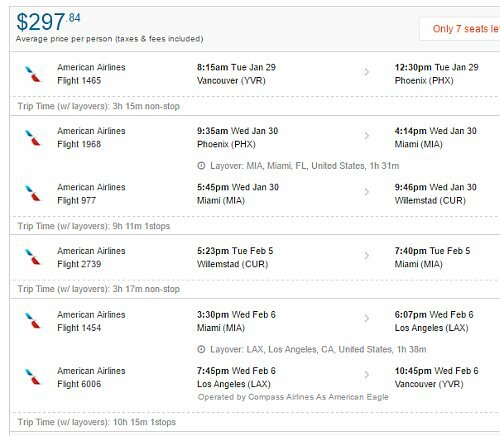 American Airlines is showing some unusually cheap flights from Vancouver to Curacao for $298 roundtrip including taxes. 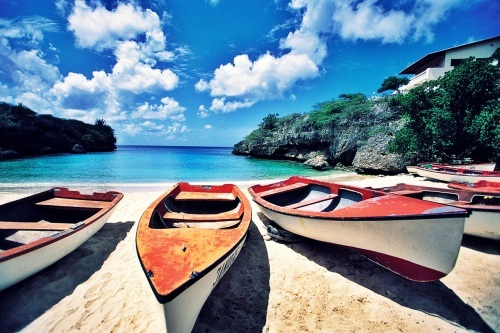 Curacao is a Dutch Caribbean island (very far south, near Aruba and Bonaire). However, it involves an overnight layover in Phoenix and a 24 hour stay in Miami, and should only be considered a good deal if visiting those cities are considered part of your vacation. It depends on what flights you select, but it's possible to build an itinerary that looks like this..
vancouver, yvr, flight deals, american airlines, miami, mia, florida, caribbean, united states, phoenix, phx, north america, southern caribbean, curacao, cur, leeward antilles, lesser antilles and netherlands antilles.